Long live the Maillard reaction! 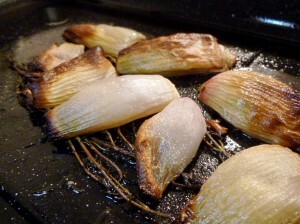 Upon the application of heat, the sugars in the shallots caramelise down in to a beautiful toffee buff. They become the perfect counterpoint to the sun dried tomatoes, which I sometimes find a bit too ferric for my liking otherwise. This was a happy-accident dinner salad that is beyond the sum of its parts. In terms of nutrition, the quinoa is providing protein and iron, while the sun dried tomatoes have lots of lycopene, a cancer-fighting agent. Rocket and the shallots are providing vitamin C.
1 Preheat the oven to 170 degrees. Place your sprigs of thyme in a roasting dish and put your shallots on top, little birds on wires. Liberally cover with oil and season. 2 Roast the shallots for 25 minutes, beginning checking at 15. They turn in the blink of an eye, so if they’re catching without cooking, turn the oven down a bit. They’re ready when they’ve got browned edges and very light caramel coloured flesh. 3 Make your vinaigrette with the balsamic vinegar, olive oil, mustard and honey. I favour making in an old jar and shaking, but whatever you fancy. 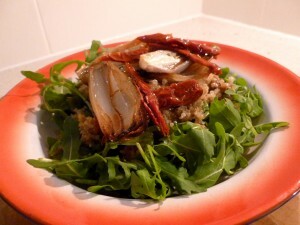 4 Put your shallots (either cooled or still warm) on top of your rocket, quinoa and sun dried tomatoes and pour over the dressing.